Just a short post, but another demo is online. It is a demonstration of the “elastic list” principle for browsing multi-facetted data structures. Click any number of list entries to query the database for a combination of the selected attributes. If you create an “impossible” configuration, your selection will be reduced until a match is possible. 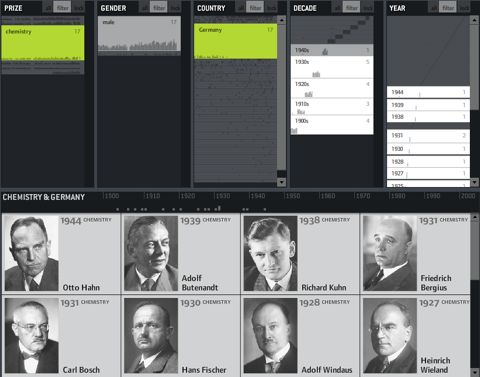 The example data is based on the Noble prize winners dataset used in the Flamenco facet browser. Elastic lists enhance traditional facet browsing approaches by • visualizing relative proportions (weights) of metadata values by size • visualizing unusualness of a metadata weight by brightness • and animated filtering transitions. In unfiltered view, the brightness shows a trend measure, indicating a rising number of prices of the last years. In filtered views, a brighter background indicates a higher weight of the metadata value compared to the overall distribution. If, for instance, you click “peace” as in the example above, you will see that “female” and “Switzerland” are much brighter, indicating that the proportion of women and Swiss is much higher in this context than compared to the whole data set. That’s interesting information and could also be used to characterize the result set of a keyword query or any other collection in terms of its “characteristic” metadata values. Besides that, it fosters understanding of how metadata values are correlated with each other, which is often interesting information itself.